What's wrong with SA oil consumption? Hey y'all (yep living in the south)! I am taking a look at the domestic oil consumption of Saudi Arabia, and something doesn't seem right. Consumption in May looks totally off (see chart, pink line). Any ideas what's up with that? 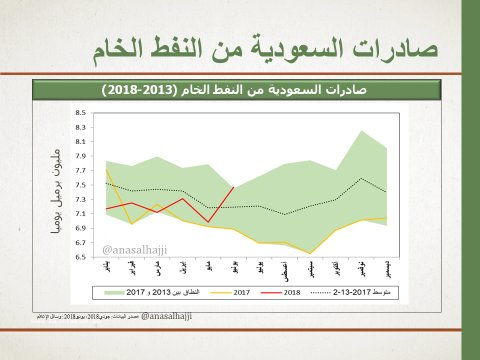 Looks even more confusing given the fact that Saudi Arabia which supposedly will hit record oil production in July, reported that exports would be flat in July . also this afternoon saudi said oil exports in August will be lower by 100,000 bpd compared to July. I guess either way it's conceivable that June and July domestic consumption increased, perhaps just not as much as in years past. That domestic increase could soak up that hundred thousand barrels per day that they are going to short the market in exports next month. 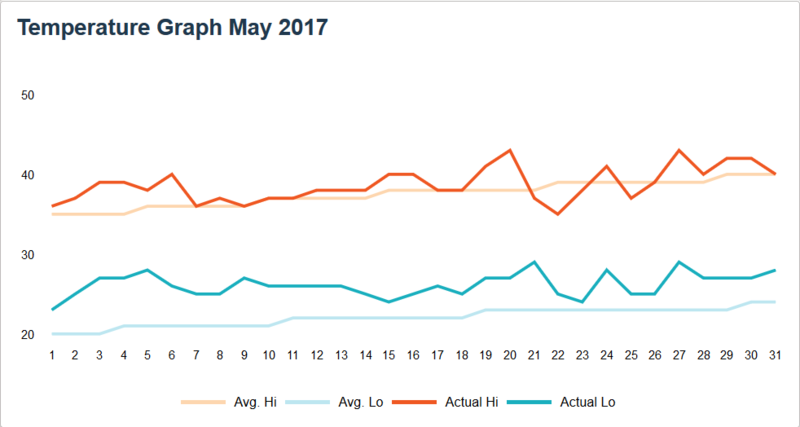 I've checked and compared the temperatures in Riyadh for May 2017 and May 2018 and it seems that in May 2018 the temperatures were under the average temperature for most of the month. 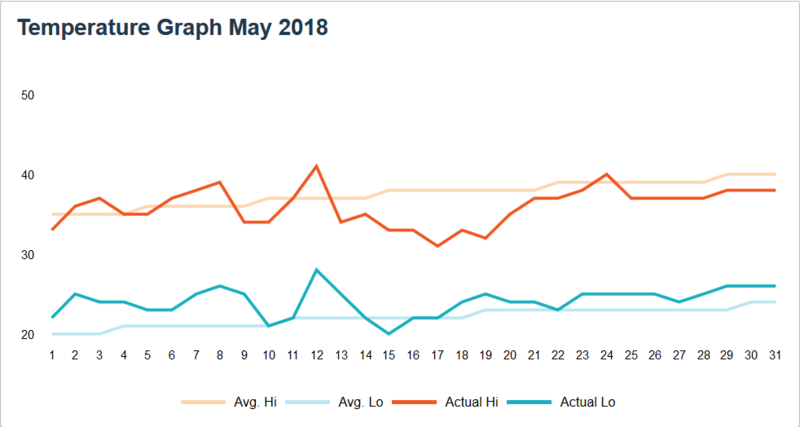 I don't know if this can explain all the difference in oil consumption between 2017 and 2018 but a milder weather in may could have postponed this year the usual summer rise of oil consumption. what is a source of your data? From memory, consumption was ~1.5M bopd. There is ~3M gap between production and export. Rodent: Yea, I don't know what to think of the recent statements coming from SA. Strange. Albasini: Thanks for the temperature graph - what is your source? Consider Ramadan. The activity levels in business and personal life, and during the day would be well down. And the accuracy of reporting data is also more suspect. 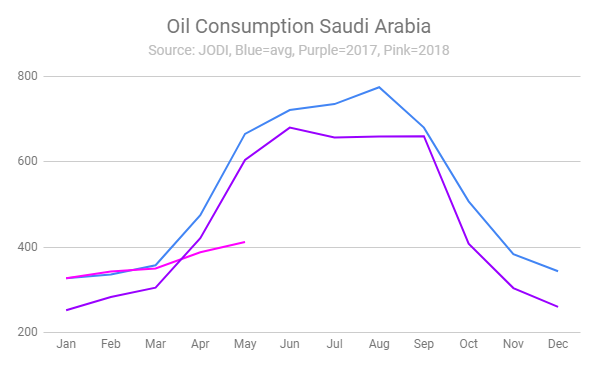 The Saudis do consume a lot of oil domestically, and it's not just HVAC and driving large SUVs but they high consumptions industries as well. Much of the commercial side of the Kingdom is struggling. I think a net decline of 500,000 expats so far this year. Mostly low wage earners in the private sector, but the higher earners as well. Construction levels are down. The country was already mothballing concrete production facilities. The trickle down effect of losing these peoples impacts a lot. The country, if it's not in a recession, is close to it, only hanging on through higher oil prices (compared to two years ago). Domestic subsidies on gasoline and electricity have been significantly cut back. Two years ago the average Saudi house was cooled to 15C (59F), typically with a poorly maintained, 8 SEER system. I wore sweater or sports coat at work to keep from freezing. Just resetting to 22C and changing/cleaning the HVAC filter would save huge amounts. Women driving in time will cut consumption. Those drivers won't be bouncing around, and of course they leave the motor running for the AC while waiting. You have to it that heat. Great insights John, thanks! Boy, ac cranked up to 59F?? I am used to 100 degree weather but I keep my house at 82F all the way through summer.